I was seven years old when first saw a video conference. Not in person, mind you, but on a TV show. The show was Star Trek. It was a re-run and my father—also a fan of the program—was watching with me. During a particularly dramatic moment, Captain Kirk (William Shatner is known for drama of course) was speaking to a nearby enemy on a giant screen on the bridge of the Enterprise. That was 1986 and now, 30 years later, video conferencing has become one of the most ubiquitous forms of business communication today. ZK Research recently estimated in a study that 90 percent of companies which use video conferencing have increased their usage over the last 12 months. Further, 89 percent of those companies expect their usage to increase in the coming year. Video is everywhere. And it’s being used in conference rooms, home offices, airport terminals, coffee shops—just about everywhere you can hook up to the Internet. Despite the rising adoption, many people are unknowingly making costly mistakes that could mean the difference between success and failure when interviewing for a job, or making a sale. You may have seen them or—gulp—perhaps done them. The good news? These mistakes are easily correctable! And Ms. Polly Calm, the world’s premier expert on video etiquette or “vidiquette” is going to help. 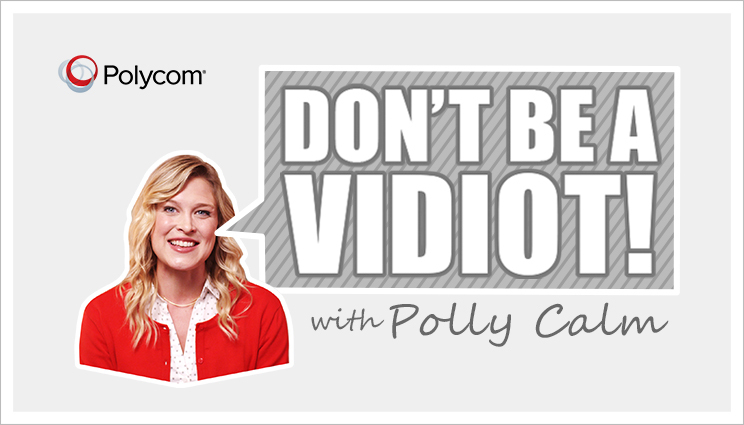 In a new six-part video series, which premieres today, Polly is going to help even the most seasoned video expert correct distracting behaviors commonly found on video calls. From loud eaters who forget to use the mute button, to potentially sharing the wrong document, to those who ignore their personal background during job interviews, Polly Calm will provide helpful tips designed to prevent everyone—novices to pros—from making embarrassing and costly mistakes. It’s entertaining, it’s educational, and most importantly, it’s designed to help us all video conference like a boss. Flexible working means being connected even when you’re remote. And video conferencing is a great way to do so, allowing you to connect across offices, to remote workers and even over time zones. If you’re going to use video, please follow Polly’s lead and use it responsibly.